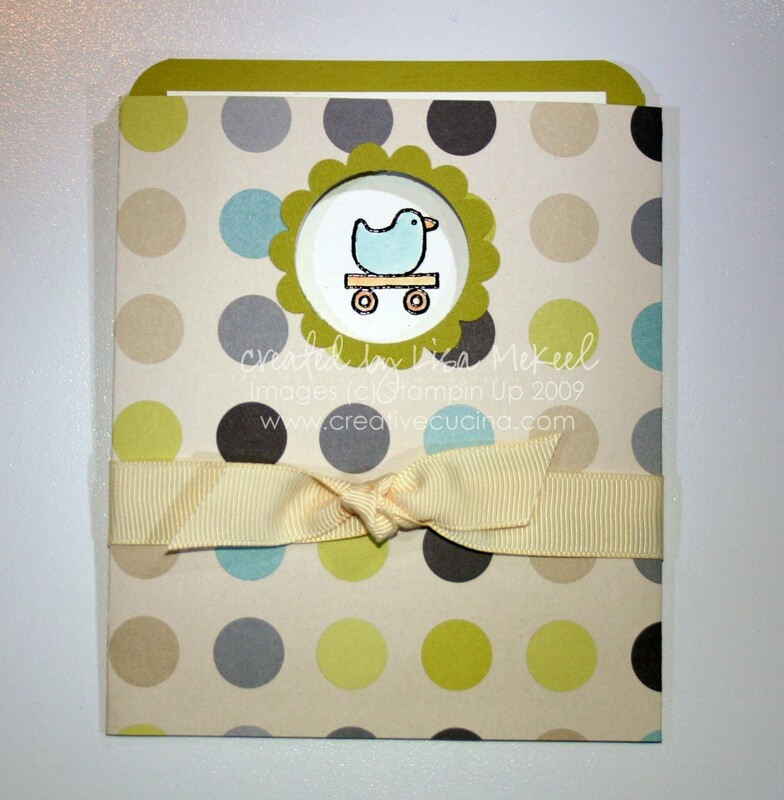 This card is similar to another one I made on striped kraft card stock, but I decided to change up the colors a bit. 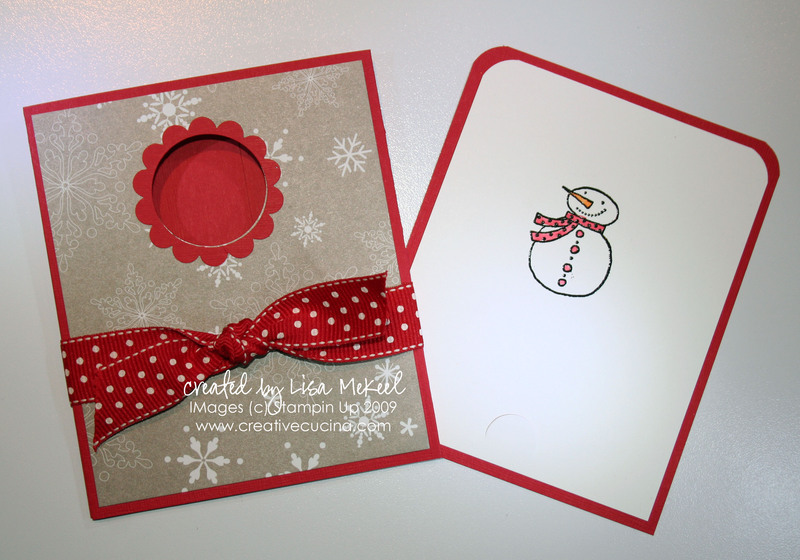 I went for a non-traditional christmas color scheme of bermuda bay card stock and kraft. 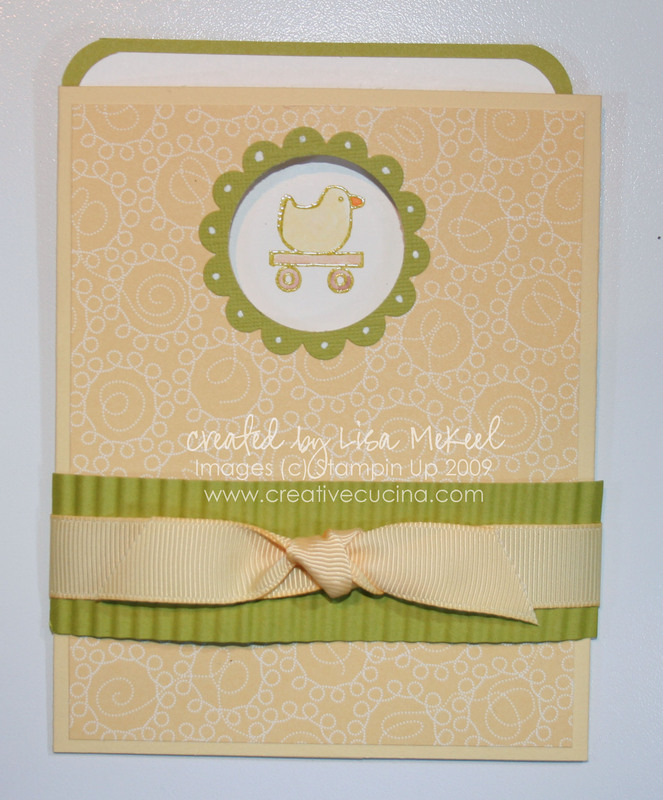 Card base is bermuda bay textured card stock, layered with kraft. I stamped the snowmen from Snow Buddies in Brown Stazon ink and colored them in with SU Watercolor Pencils and the Blender Pen. 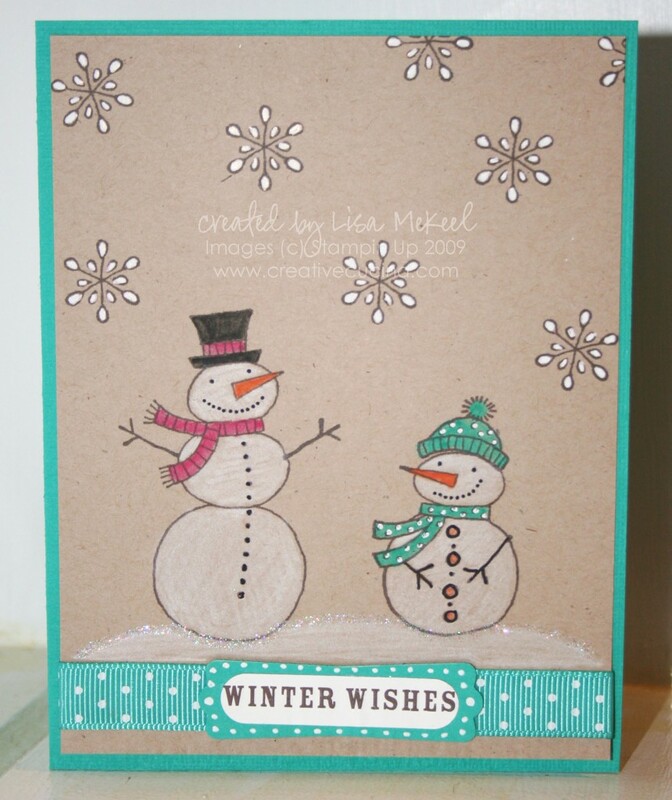 To accent the snowflakes, I colored them in with White Gel Pen. Along the bottom of the card, I drew in a mound of “snow” with my white colored pencil, traced along the top edge with my Glue Pen and then sprinkled on Dazzling Diamonds to highlight. The sentiment is from Chit Chat Rub Ons, on white card stock punched out with the Word Window Punch layered on bermuda bay punched with the Modern Label Punch. The ribbon is Bermuda Bay Polka Dot Grosgrain. I recently jumped on the Copic Marker bandwagon–they make me look like a much better artist than I am! I’m still learning how to use them, and they truly are amazing. Just like watercoloring with Stampin Up Markers, they allow you to blend and shade your images. 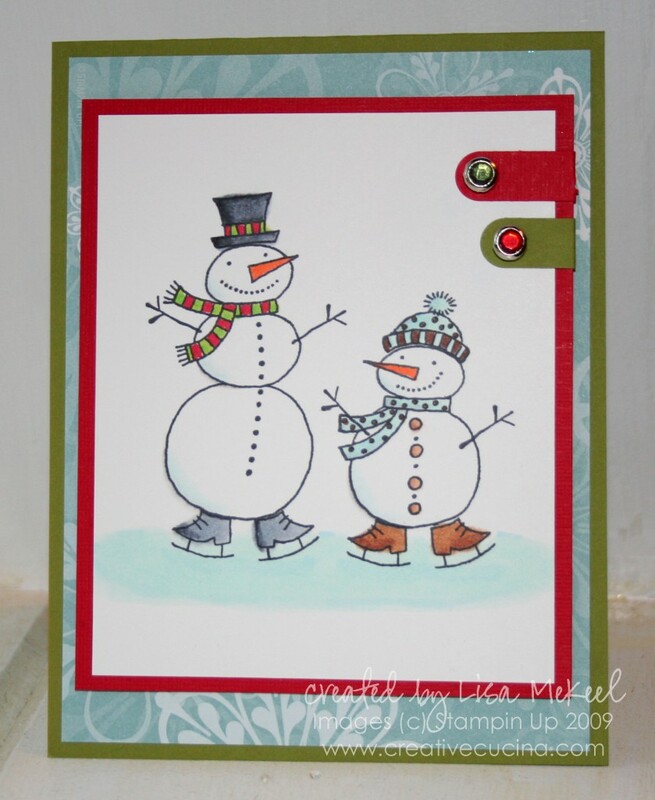 This card was made using the ever famous Snow Buddies stamp set. I stamped them in Memento black ink (you have to use that ink with Copics) and colored them in with the copic markers. The image is mounted on a piece of Real Red textured card stock. In the upper corner, I used the Word Window Punch and punched real red card stock, adhered them to the image layer, and added Circle Rhinestone Brads with the cropadile. 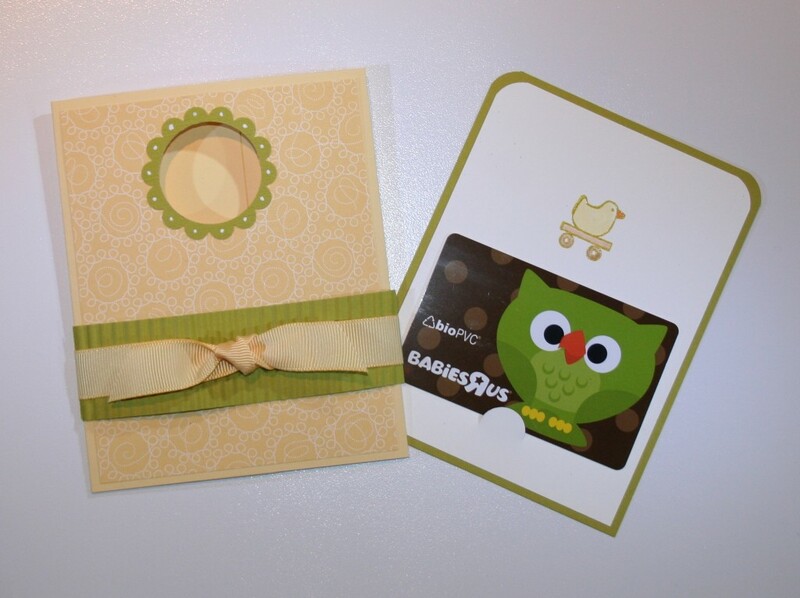 As for the card base, I used Old olive card stock cut to 4 1/4″ x 11″ with a top fold at 5 1/2″. I also added a layer of Holiday Bulk Buy DSP in a baja breeze snowflake pattern to pick up the blues in the snowmen image.